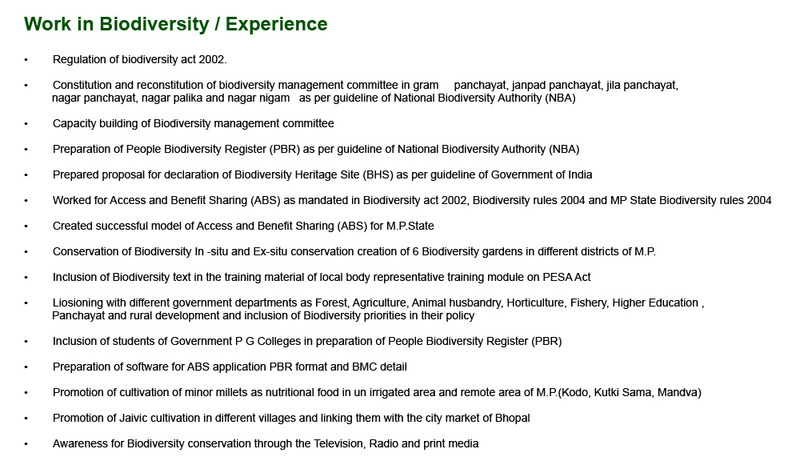 Bio-diverse India, Bio-diverse Madhya Pradesh and bio-diverse Bhopal. To see the bio happiness in each and every citizen of India. Governance that is more transparent and effective that balances global and local responsibilities in the conservation of biodiversity for future generations. High technology that is used to build a low tech world that enhance and protect biodiversity. Sustainable food production, using minimum energy and resources. Efficient use of resources through responsible production and consumption, recycling and eliminating waste. The integration of biodiversity into every part of life and in the mandate of all sectors of societies. Transforming the economic paradigm to reflect biodiversity and human values. Values and behaviors appropriate to a more harmonious way of life. The primary purpose of the Global Biodiversity education society is to promote education, research, and community services that contribute to conservation of the Indian fauna, flora and ecosystem. At the Biological Diversity, we believe that the welfare of human beings is deeply linked to nature. Support and engagement for the mainstreaming of biodiversity concerns into regional integration processes. We have to make development programs. Close cooperation with forums such as the Group of NGO’s and the Group of Like-Minded persons involved in the conservation of biodiversity and sustainable use of biodiversity. Dialogue Forum in order to foster cooperation and enhance the solidarity and the interdependence of organization, NGO’s and institutions. A multi-stakeholder approach including academic institutions, the private sector, development partners, regional organizations, non-governmental organizations, and local community and indigenous peoples organizations.